The government should step in and investigate the true nature of financial institutions that may be systemic failures just waiting to happen. Failure by the government to take action is not in the best interests of Australian and its economic stability, security and longevity. My advice as layman and ordinary bloke is to get the bottom of this financial mess and fix it once and for. Greed is no longer considered good nor is avarice and nefarious characteristics of those responsible setting good examples to Australian society. 03 July 2014. CBA boss says ‘sorry’ for financial scandal. CBA boss Ian Narev has apologised to more than 1100 customers who lost savings as a result of misconduct. IT’S a scandal involving fraud, forged signatures, thousands of clients and millions in hard-earned savings. Now the CEO of one of Australia’s biggest banks has finally apologised to more than 1100 people who lost money as a result of fraudulent advice and misleading behaviour at the bank between 2003 and 2012. Source: AFP. “To all the customers who received poor advice, I apologise unreservedly. 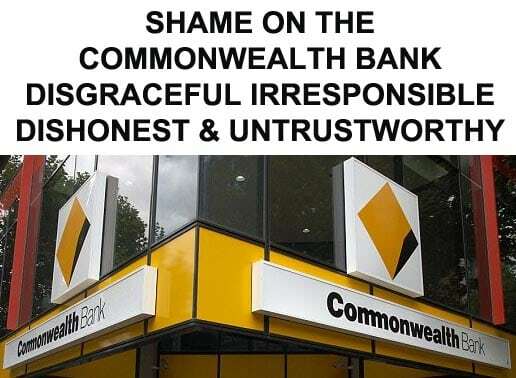 We are truly sorry and we acknowledge the financial hardship you suffered as a result,” said Commonwealth Bank CEO Ian Narev at a press conference this morning. Mr Narev also addressed the “defensiveness” the bank has been accused of, saying it felt it was doing the right thing at the time. He said this will now be replaced with a “spirit of openness” including an open advice program to prevent the scandal ever happening again that will allow customers who received bad advice to have their cases reviewed and be compensated. “We’re doing this bottom-up and we’re doing this customer by customer,” he said. “There is no doubt there will be some people out there who believe this is inadequate. We believe we’re doing the right thing.” Mr Narev also didn’t rule out the possibility of uncovering more wrong doing and said there would be no financial limit on compensation. However it’s not expected to be of “material” significance from a shareholder perspective and will be limited to money lost as a result of bad advice. Cases will be assessed on what portfolio profile those clients should’ve been on (based on the right advice) versus what profile they were actually in (based on bad advice). There is no mention of any financial compensation for emotional distress. The bank has already paid $52 million to affected clients. The bank has apologised to more than 1100 customers who received fraudulent or misleading advice. ROGUE PLANNERS. The apology comes after dodgy-dealings within CBA’s financial planning division between 2006 and 2010 were unearthed when employee Jeff Morris blew the whistle to ASIC, the corporate watchdog. However, ASIC was slow to act and took over a year to mount an investigation into Mr Morris’ allegations. Mr Morris revealed CBA planners were switching clients onto high-risk, but profit generating, products without their clients’ permission. In some cases, this involved forging clients’ signatures on documents. When the GFC hit in 2008, thousands of clients lost millions of dollars. TOOTHLESS TIGER. ASIC’s slow response to Mr Morris’ whistleblower claims was the subject of a cross-party Senate inquiry which handed down its findings last week. While the inquiry was ostensibly a probe into ASIC’s actions, it was the CBA which received the brunt of the criticism. The Senate report said staff at CBA placed their own personal interests ahead of their clients and accused the bank of downplaying the seriousness of the problems in an attempt to stave off ASIC scrutiny. The Senate committee also recommended both CBA and ASIC front a royal commission. Liberal Senator David Bushby was the only member of the Senate committee to disagree with its 61 recommendations. In a dissenting report, Senator Bushby said another inquiry might not be the best way forward. The federal government downplayed the likelihood of a royal commission with Prime Minister Tony Abbott and Finance Minister Matthias Cormann’s response to the report tepid at best. Mr Cormann said Senator Bushby’s dissenting report made a convincing argument. Ms Swan said Senator Bushby was absent on the day of crucial testimony from the whistleblower and victims. Prime Minister Abbott said the government won’t formally respond to the Senate report until after a financial system inquiry had concluded. That inquiry is being headed by former CBA chief David Murray. Financial Planning Association of Australia CEO Mark Rantall is calling for a Summit on the subject. CUSTOMERS AT RISK, AGAIN. Under the Labor government, laws designed to protect investors from bad financial advice was introduced on 1 July 2013 after a series of failings by the banking sector including the collapse of Storm Financial. “This regulation exposes consumers to significant risk. We have seen scandal after scandal where financial advisers have taken advantage of their clients. “We are asking federal politicians to protect basic principles. Consumers should be able to feel confident that they are getting impartial financial advice they can trust.” Labor, the Greens and Palmer United have already committed to winding back the Abbott changes. The Financial Planning Association wants to see changes that will restore trust in financial planning and are calling for a summit on the issue chaired by an independent figure. “Our primary focus is the impacted clients of CBA and ensuring we never see something like this again. We need a system where when things go wrong, members of the profession act with speed and complete fairness,” FPA CEO Mark Rantall said. The bank will open an advice review program to avoid the scandal occurring again. WHAT’S NEXT FOR CUSTOMERS? In addition to the ability to claim compensation, CBA announced an in-house review into the advice its financial planners gave to customers during that period. Mr Narev said it was disturbing that some planners at the bank’s Commonwealth Financial Planning (CFP) and Financial Wisdom (FWL) businesses had breached customers’ trust. “They failed in their primary obligation — to act in the best interests of our customers,” he said. Mr Narev said the review program would allow CFP and FWL customers to have the advice they received from financial planners reviewed and assessed by an independent advocate. However not everyone is convinced. CHOICE CEO Alan Kirkland questioned the sincerity of the apology given the bank is still lobbying to reduce consumer protections in the FOFA legislation. “If the Commonwealth Bank was truly sorry they would not have lobbied to remove essential consumer protections for financial advice. Just a few weeks ago the Commonwealth Bank wrote to the government calling for lower standards for financial advisers – this action does not match today’s apology,” he said.